With all these boys in the house, I jump at the chance to make something floral and frilly for a little lady. 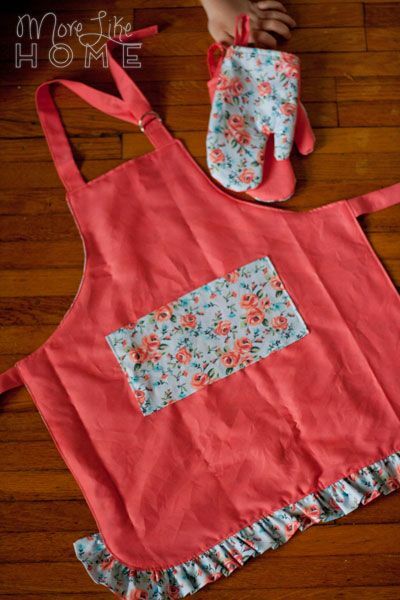 So when my sister gave my niece a little play kitchen for Christmas, I was thrilled to make the sweetest little apron and oven mitt set to go with it. It's one of the most fun projects I've made in a while! And my niece loved them so much, she would hardly take them off! 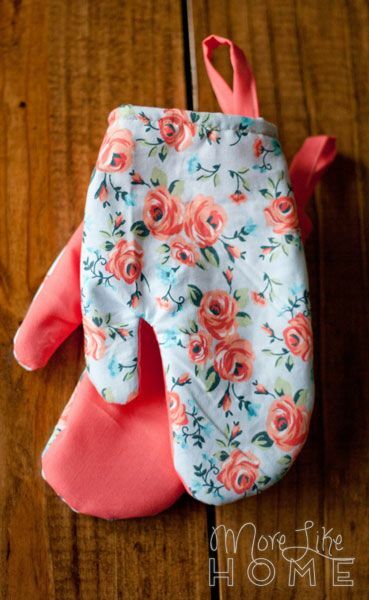 I've made aprons before, but this was my first attempt at mini oven mitts. I love how they turned out! 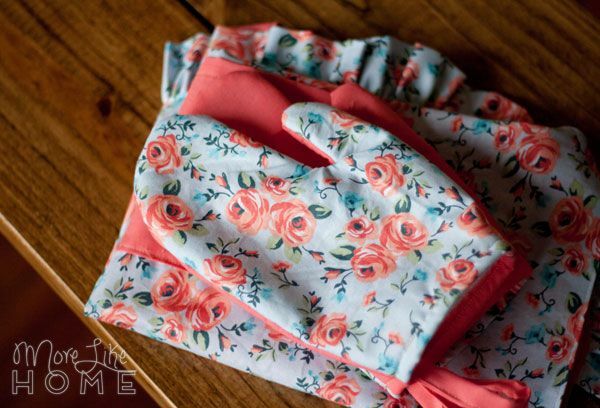 I used the same fabric as the apron and lined them will fleece batting to help them hold their shape and feel like real oven mitts. I also added little loops for hanging them on a hook on her play kitchen. It made such a cute little set! 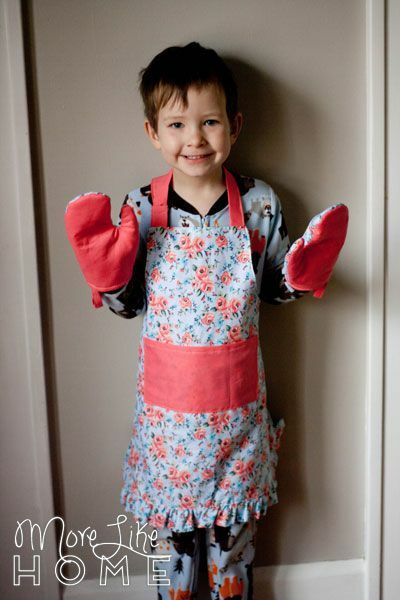 I made the apron using my kid's apron pattern. 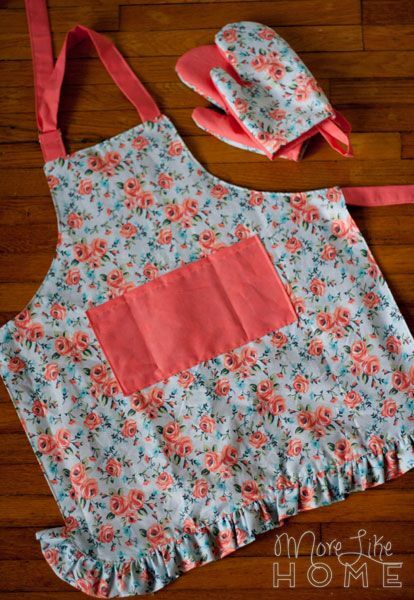 It's a reversible apron with a pocket on each side, an adjustable neck strap, and a super cute ruffle around the bottom (but you can omit the ruffle if it's not your jam). 1/4 yard should be enough if you're buying fabric (I made mine with scraps from the apron). 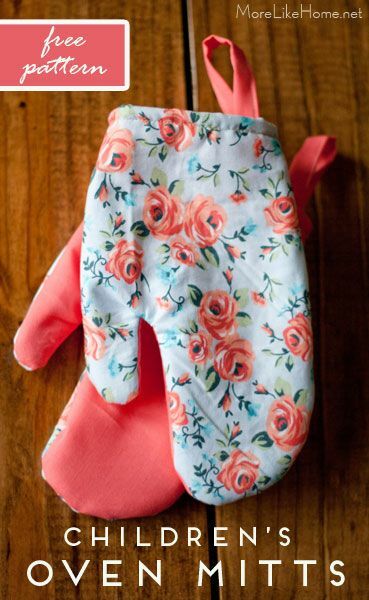 You can get two different fabrics for the top and bottom of the mitts, or use the same fabric for both. Print out the pattern (download it here). Make a stack of pieces like this: 1 fleece batting, 1top mitt piece right-side up, 1 bottom mitt piece right-side down, 1 more fleece batting on top. Sew around the mitt with a 1/2" seam allowance, leaving the bottom open. Fold the fabric around the opening under 1/2" and stitch around the edge. Cut a 4" piece of ribbon (or make a strap with fabric). Fold it in half and insert the raw ends into the oven mitt about 1/2". Sew the ends in place. 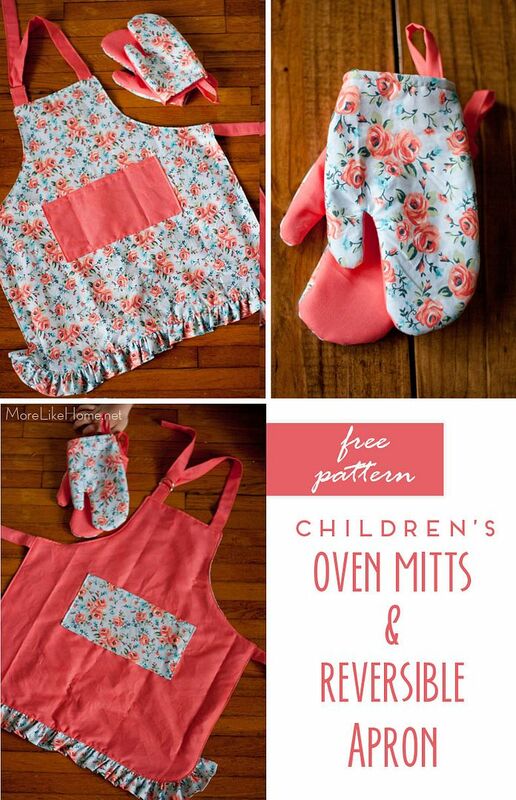 Repeat to make the other oven mitt. That's it! I didn't bother lining the mitts since they are just for play and I wanted to keep them super simple to make, plus the fleece is nice and soft inside anyway. 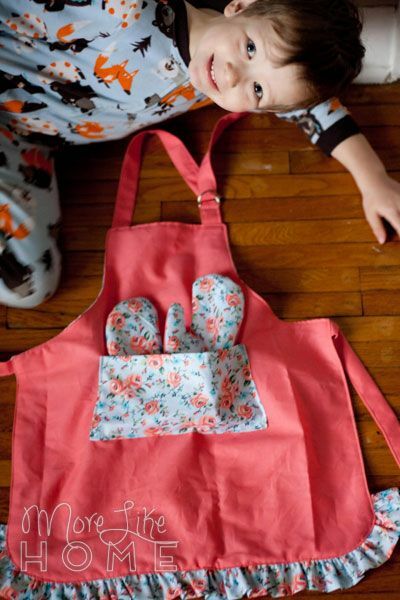 Wondering how the apron & mitts will fit your child? I can help with that. 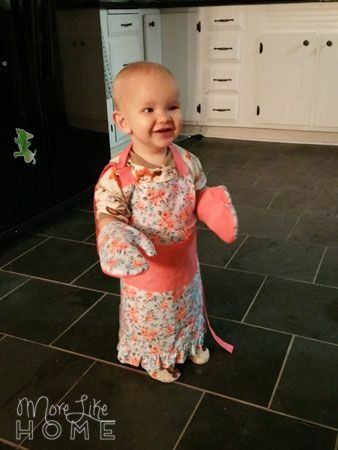 Here they are modeled by a one-year-old. I folded the waist up just a smidge before I tied it. And here it is on a five-year-old. It hits right at his knees. And for the record, they were all fighting over turns to try it on before we wrapped it. He says the oven mitts should always go in the pockets. Just FYI. And just like that, it's back to little boy things. 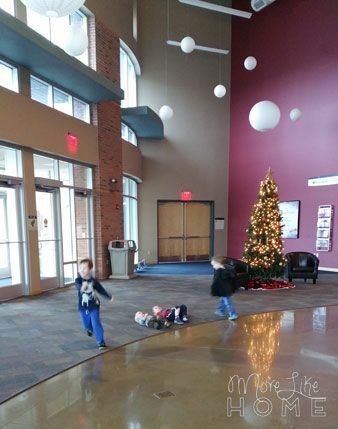 Things like running in circles and laying on the floor in the middle of lobbies. They are very good at it. So tell me: who do you sew for most of the time?